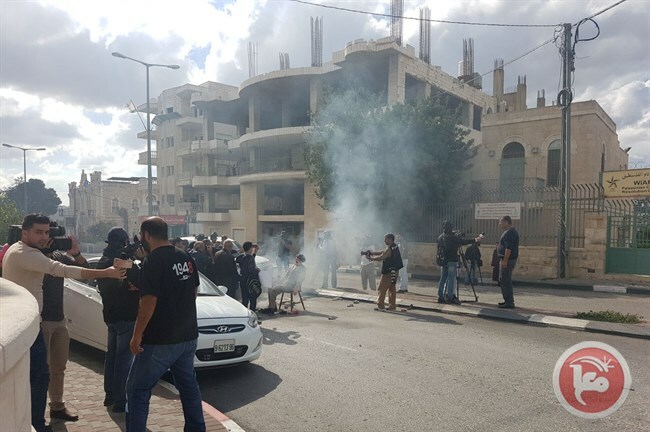 BETHLEHEM (Ma’an) — Clashes erupted between Palestinians and Israeli forces in Bethlehem city on Wednesday following a march commemorating the 100th anniversary of the Balfour Declaration, the 1917 document which supported establishing a Jewish state on what would become British Mandate Palestine, and paved the what for the to the establishment of Israel. 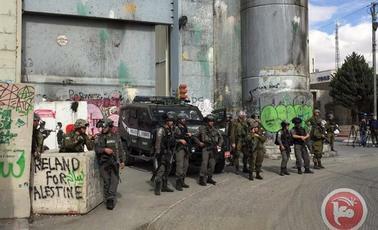 Palestinian protesters marched from the southern to northern ends of the city, until they reached Israel’s separation wall. 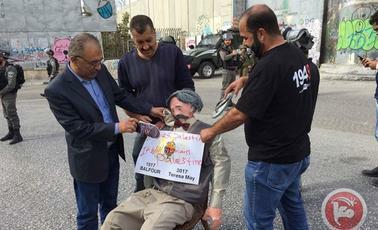 Protesters set up an effigy of Arthur Balfour, the author of the declaration, beating and throwing shoes at the figure while burning a copy of the declaration. 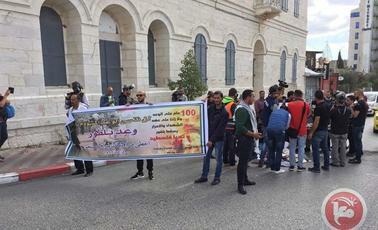 Members of various Palestinian political factions had called for the march in protest of the 100 year anniversary of the declaration, and of recent comments by British Prime Minister Theresa May celebrating the centenary of the declaration. Israeli forces quickly suppressed the protest, using live ammunition, rubber-coated steel bullets and tear gas, injuring one with a rubber-coated steel bullet in the foot, while several others suffered from severe tear gas inhalation. Palestinians have viewed the declaration as paving the way for the creation of the state of Israel at the expense of the land’s original inhabitants.